Nexgen Hosting Review 2019: Is Nexgen Hosting a Good Hosting? Nexgen is a domain registration and cloud hosting company based in India. The vendor hosts SMEs from India and several other countries across the globe. Nexgen is an India-based hosting company that started operations in 2010 in Chennai. It markets itself as a provider of top-notch website solutions backed by excellent support. Some of its solutions include cheap domain names, shared web hosting, VPS, and dedicated servers solutions. Nexgen has invested in powerful VPS infrastructure to provide high performance and reliability. The vendor’s VPS hosting system is a combination of high-speed SSDs, a redundant gigabit network, Intel 64-bit Hexa-core (six cores) 2.8 Ghz processors, hot spare disks and servers, and multi-layer firewall security with DDoS protection. In addition, the hosting firm’s servers are powered by KMV for guaranteed availability for all its dedicated and VPS packages. Nexgen’s web hosting solutions are designed to suit businesses of all sizes: from single websites and blogs to corporate websites that receive lots of traffic every month. The most popular shared hosting package is the Enterprise plan. It is suitable for hosting multiple websites and includes 10GB storage, 100GB monthly bandwidth, and can host up to 75 email accounts. In addition to offering free SSL certificates in its hosting solutions, Nexgen offers paid SSL certificates as additional packages for clients who might require advanced website security. Some of the digital certificates the vendor has made available to its customers include Globalsign SSL, Startcom SSL, and Comodo SSL. Nexgen offers some of the most economical hosting plans. They come with free migration and first-time customer discounts. Prices are listed in Indian rupee, and don’t lock customers into long term contracts. Instead, users can pay-per-month with the option to cancel at any time. 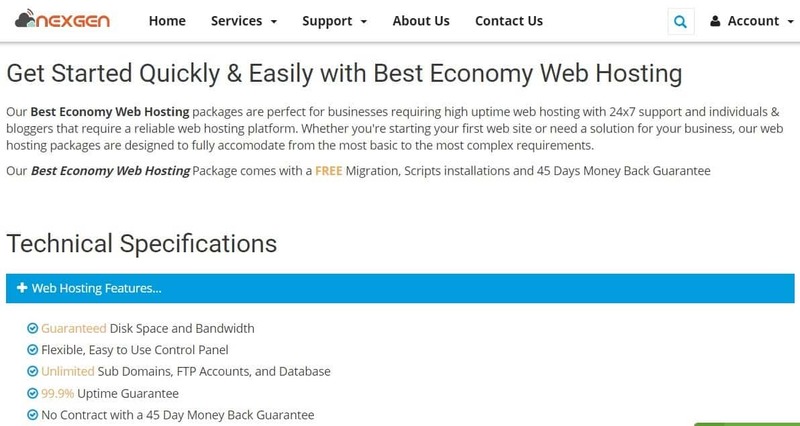 Nextgen Hosting has two refund policies: a 45-day money-back guarantee for web hosting, VPS, and dedicated servers and a 30-day money-back guarantee for reseller hosting. All plans have a guaranteed 99.9% uptime network availability. Nexgen customers can contact its support team via telephone, ticketing system, email, or live chat. The vendor’s support system is only available to existing customers. Anyone else has to send them a message via live chat, which is often offline. I tried to get in touch with them several times to no avail. What’s more, the hosting provider’s knowledge base section on its website has no articles or tutorials. Nexgen has the necessary infrastructure to host SMEs in India and beyond. However, the vendor’s apparent failure to invest in its support team means that users who buy these solutions might have to contend with prolonged periods of waiting to hear from this vendor every time they present an issue that needs solving. This would especially be a challenge to novice webmasters who need a lot of guidance, yet cannot turn to the vendor’s knowledge base. Buy KMV powered hosting at Nexgen Hosting! Wondering how Nexgen Hosting stacks up against other Web Hosting companies? Enter any other Web Hosting company and we will give you a side-by-side comparison.